I was inspired by the excellent sausage roll served at Little Black Bird in Hastings. I used some delicious venison sausages made by Carterton Meats who process wild game. Makes one large sausage roll to serve six. You don't need much pastry as the filling is quite structurally stable. The breadcrumbs absorb the moisture from the vegetables and fat from the sausage meat to keep it moist. If you make just before baking it won't take long to cook as the filling will still be warm. Don't add salt as sausage meat is usually well-salted. Milk and sesame seeds to decorate. Run the onion, carrot, apple, pumpkin and chilli pepper through a food processor with a large grating disc attached or grate by hand into a bowl. Heat the oil in a large pan and fry the grated vegetables with the cumin seeds for about 10 - 15 minutes, stirring occasionally, until soft. In a large bowl mix the sausage meat, breadcrumbs and parsley. Add the cooked vegetables whilst still warm and mix well. Roll out the pastry thinly on a floured work surface to a rectangle 30cm x 20cm. Join sheets if required by sealing the edges with a little water. Tip out the sausage mixture onto the pastry and form into a log-shape along the centre of the sheet. Bring the long edges together to wrap the filling, sealing with a little water. 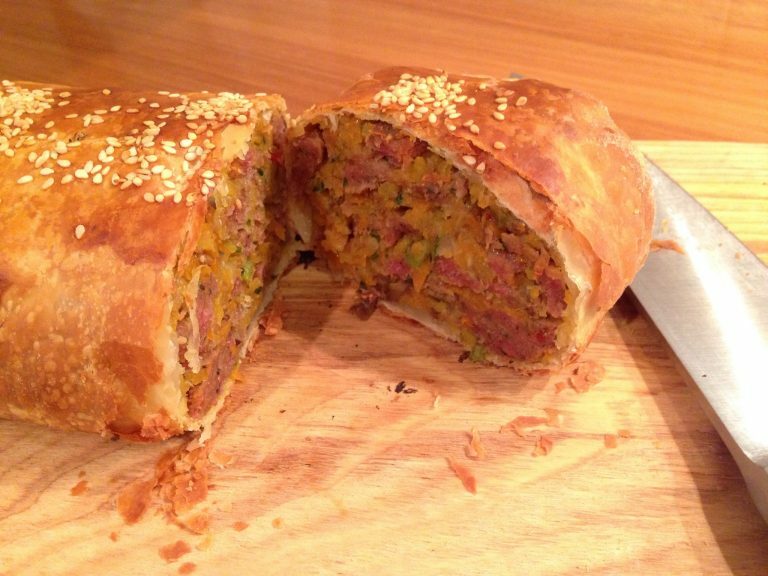 Turn over the sausage roll so the seam is at the bottom and place on a baking tray lined with baking paper. Brush with milk and sprinkle with a few sesame seeds. Allow to stand for five minutes before serving in thick slices. Serve with buttered steamed cabbage and tomato ketchup.